“Perhaps the political threat to scientific knowledge abroad has pushed the issue higher on the agenda of the Swedish people? In that case, this record level of confidence could be a sign that Swedes want to safeguard the importance of research for society,” said Gustav Bohlin, Researcher at Vetenskap & Allmänhet (Public & Science). In the survey, 61 percent of Swedes say they have very or fairly high confidence in universities. This is an increase of five percentage points since the previous year and the highest measured since the question was first asked in 1997. Highly educated people have greater confidence than those with lower levels of education. And younger people have greater confidence than older people. However, the strongest link is between confidence and place of residence: Confidence in universities is lowest in rural areas and highest in Sweden’s largest cities Stockholm, Gothenburg and Malmö. ”Where you live has a considerably greater impact on confidence than your level of education or age. These are big differences that need to be investigated further,” said Gustav Bohlin. The survey also measures confidence in different research fields. Medicine is highest (76 percent have very or fairly high confidence), followed by technology (67%), natural sciences (61%), social sciences (49%), educational sciences (42%) and the humanities (39%). ”The main difference between, for example, medicine and the humanities is not that more people express a low confidence in the humanities. The reason for the difference is that a lot more people lack an opinion regarding the humanities. We hope to investigate the reasons for this in a forthcoming study,” said Gustav Bohlin. 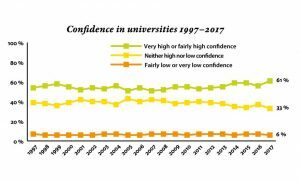 Swedes’ confidence in researchers has remained stable over recent years. In the previous two surveys, 62 percent have very or fairly high confidence in how researchers do their work. Only three percent say they have very or fairly low confidence. Different groups’ confidence in researchers has a similar pattern to their confidence in universities. Among those with a low level of education, 59 percent have very or fairly high confidence in researchers, compared with 68 percent among highly educated Swedes. Among residents of rural areas, 54 percent have very or fairly high confidence, compared with 71 percent among people living in Stockholm, Gothenburg and Malmö. Every year, Swedes are asked about which fields of research they think Sweden should be investing in at ”world-class level”. The highest levels of support were for research on cardiopulmonary disease and the environment (96 and 92 percent, respectively, consider it very or fairly important to invest in these fields). Research on space and philosophy get the least support, with a third of respondents viewing these as important fields to invest in. ”In Sweden and in many other countries, a lot of research is publicly funded. For this system to work, the public, i.e. the taxpayers, need to be confident that researchers and their institutions use the money wisely. We have been monitoring what Swedes think of these issues through various studies since 2002,” said Maria Lindholm, Director of Research at VA. The report is based on the results of the 2017 SOM (Society, Opinion, Mass Media) opinion survey and is written by Dr Gustav Bohlin. The survey is sent to a nationally representative sample of 3,400 people aged 16-85 years living in Sweden. The report is part of the Science in Society project, a collaboration between VA and the SOM Institute, supported by the Riksbankens Jubileumsfond (The Bank of Sweden Tercentenary Foundation), the University of Gothenburg, Lund University and Uppsala University.